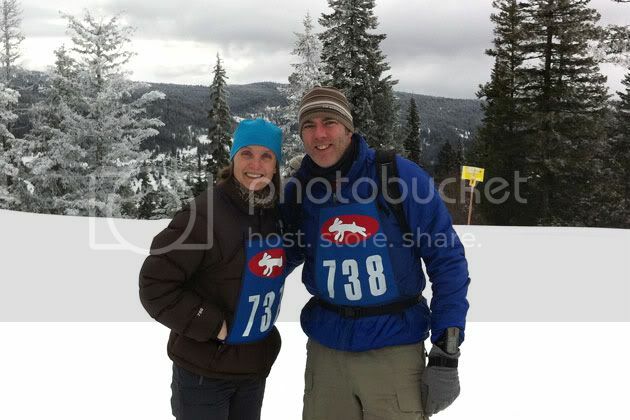 Today Chris and I took part in our first snowshoe race at Crystal Mountain resort up in West Kelowna. We signed up for the 5km option (after seeing that the first half of the 10km route was all uphill!). Even our 5km route wasn't all plain sailing I have to say. We took the chairlift to the top of the mountain (So far, so good though it was helluva cold!) and gradually wound our way back down the mountain from there (with a little ravine crossing giving us a cheeky slog uphill in the middle somewhere) I haven't felt burn like this. Perhaps I don't run so hard, or have such cold air whipping through my lungs or even this nice lil' cold I have going on at the moment but man it was hard!! We managed a sprint away from the start line (there were TV cameras so we had to make the effort right?!) and then it was mostly a brisk walk. I have probably wrecked Chris's knees for life by making him run down a couple of downhill sections (the only bits I could manage but probably his last choice for a spot of jogging!) And of course the obligatory sprint to the finish line just over an hour after setting off! It was a small race, but fantastically organised and everyone was so friendly. The sponsors outdid themselves too. 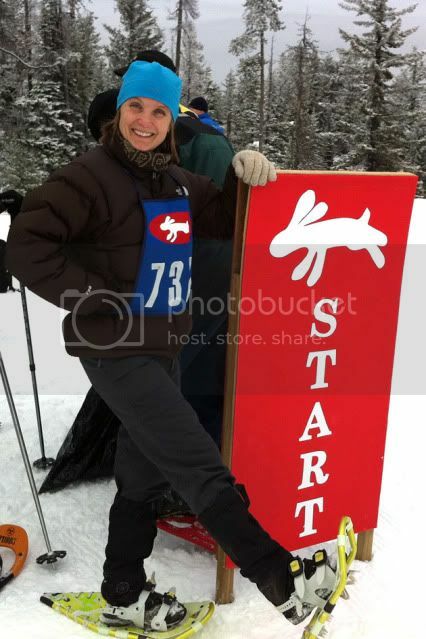 After all the top placed winners picked prizes from an enormous pile from top-of-the-line snowshoes, bags, poles, gaitors and outdoor clothing to vouchers for house-cleaning, Curves gym and ski lift tickets all the other finishers got drawn randomly to pick up prizes too. We both won something! 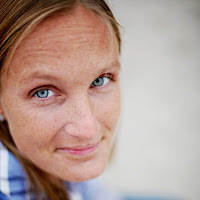 I picked a starlit snowshoe tour with fondue dinner for 2, and Chris scooped a $50 voucher for a local Italian restaurant. Incredible and so generous - way more than we paid for the entry fees and a fantastic (if exhausting!) way to start off our weekend!